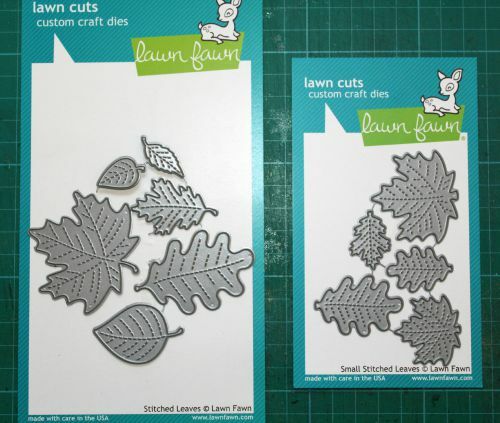 Well according to the met office the 1st of September is the start of autumn so that means i can start using The lawn fawn stitched leaves dies. I have mixed up the old set and the new smaller version. I coloured some white card with distress inks first then die cut the leaves. The largest one is from the original leaves dies. 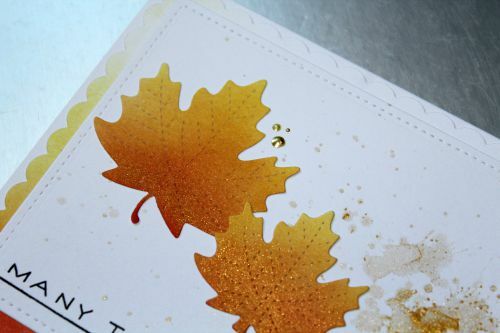 Once they were die cut i added some more ink to the bottom parts of the leaves and dusted some perfect pearls in gold on them, it gives an amazing shimmer. I also added some of the perfect pearls to water and splashed onto my panel and dried with a heat tool. 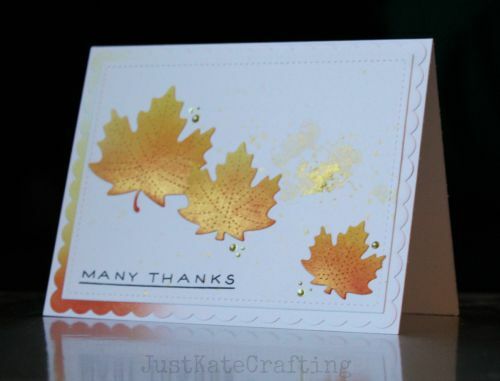 I wanted to add a matt using the new scalloped stackables from Lawn fawn and used some of the card with colour on it. To finish i stamped the sentiment from Many thanks and added some dots of gold liquid pearls. Just so that you can compare the size difference the left is the original set and right the new smaller one. Everything used is linked up below just click the images.